Road trip: those are still the two most inspiring words to vagabonds and couch potatoes alike; after all, the great American spirit was forged by road trippers from the Pilgrims to Lewis and Clark to the Dharma Bums. Le Road Trip combines the appeal of the iconic American quest with France's irresistible allure, offering readers a totally new perspective of life on the road. 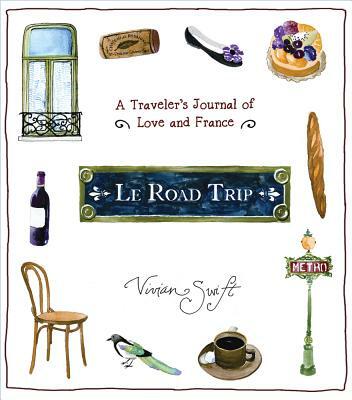 Le Road Trip tells the story of one idyllic French honeymoon trip, but it is also a witty handbook of tips and advice on how to thrive as a traveler, a captivating visual record with hundreds of watercolor illustrations, and a chronicle depicting the incomparable charms of being footloose in France. Armchair travelers, die-hard vagabonds, art journalists, and red wine drinkers will all find something to savor in this story. Vivian Swift is a freelance writer and former assistant vice president of Christie's Inc. This is her first book.